NOAA's Suomi NPP satellite passed over Tropical Storm Fiona as it developed in the northeastern Atlantic Ocean and captured a visible image of the strengthening storm. On Aug. 17 at 11:24 a.m. EDT (15:24 UTC) the Visible Infrared Imaging Radiometer Suite (VIIRS) instrument aboard NASA-NOAA's Suomi NPP satellite captured a visible light image of Tropical Depression 6 as it was strengthening into Tropical Storm Fiona. At the time, the National Hurricane Center noted that the depression's overall cloud pattern and low-level wind field continued to improve, as was visible in the Suomi NPP image. The depression became a tropical storm at 5 p.m. EDT and the sixth named storm of the Atlantic Ocean Hurricane Season. 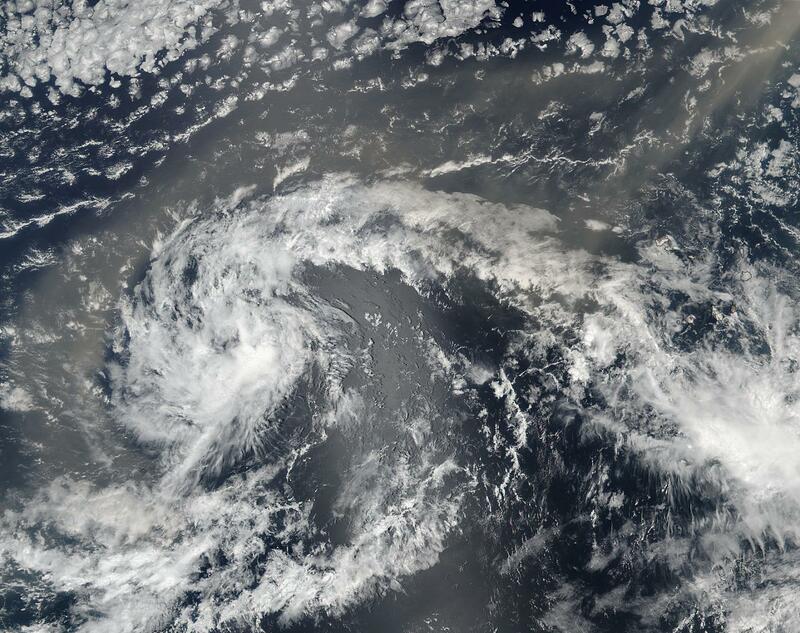 Southwesterly wind shear that had pushed the bulk of clouds and showers to the northeast of the storm's center on August 8 had weakened and has kicked up again on Aug. 11 and Aug. 12. The southwesterly winds were as strong as 23 mph (20 knots/37 kph). At 11 a.m. EDT (1500 UTC), the center of Tropical Storm Fiona was located near 16.4 north latitude and 40.5 west longitude, about 1,095 miles (1,760 km) west of the Cape Verde Islands. Fiona is moving toward the west-northwest near 8 mph (13 kph) and the National Hurricane Center said this general motion is expected to continue during the next couple of days. The estimated minimum central pressure is 1006 millibars. Maximum sustained winds are near 45 mph (75 kph) with higher gusts. Slow strengthening is possible during the next day or so, followed by gradual weakening over the weekend.